Recently refurbished to a high standard. Palmeira Court is a modern & stylish, fully furnished, two double bedroom apartment in the heart of Westcliff-on-Sea in Southend-on-Sea. Located just off of the seafront, boasting beautiful sea views from the kitchen and living spaces. A three minute walk away from Westcliff Station & the Cliffs Pavilion. With it’s own off-street parking space, WiFi throughout the first floor apartment & option of a twin room upon request; we are the perfect location for all. -Two double bedrooms, complete with storage, hanging rails & hangers. Bedroom 1 has a King bed, with an option to change to Twin beds upon request. Bedroom 2 has a double bed. Both bedrooms have a 32” flat screen TV. -One bathroom with bath, separate power shower & mood lighting (towels provided). 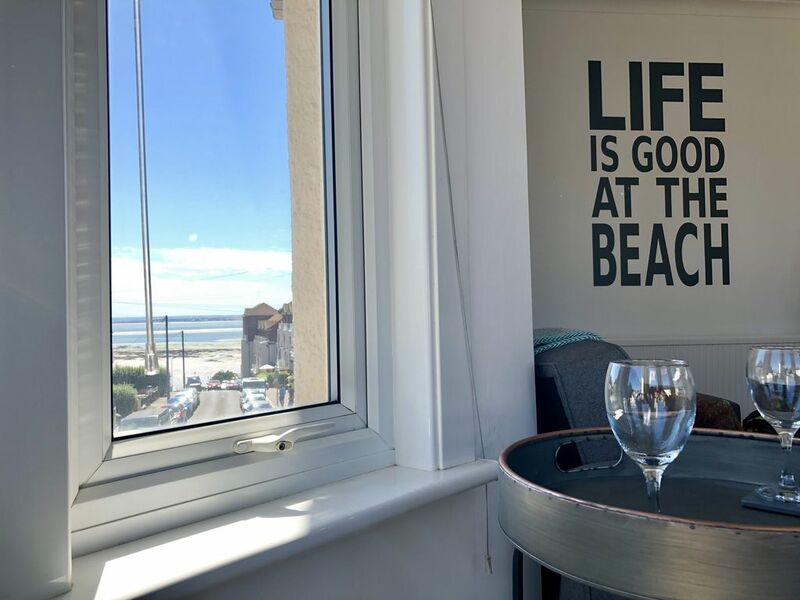 -Large Living room with 55" flat screen TV, 5 seater corner sofa, and separate 2 armchair seating area beside the bay window; complete with sea view. -A sofa bed is available upon request in the living room for bookings over 4 guests. -Fully equipped kitchen with 4 seater table/chairs and beautiful, clear sea views out the front of the apartment. Complete with electric oven & hob, fridge/freezer, toaster, washing machine & microwave (welcome tea & coffee available on arrival). -We have our own, off-street parking space located right next to the building. Available to use from check-in to check-out. PLEASE NOTE THIS IS FOR SMALL TO MEDIUM SIZED VEHICLES ONLY. -Welcome tea & coffee available on arrival. -Travel cot & highchair available upon request. -Free on street parking is also available outside the apartment, as well as the apartments off street parking space. -Self check-in via key lock box. Apartment is accessible via stairs only. There is no lift in the building.